The Bullseye Locations promotion module is an easy-to-use marketing tool designed to help manufacturers drive more traffic to retailer stores with geo-targeted offers delivered right to users at that critical point in their decision process when they are looking for the nearest store, dealer, franchise or outlet. Bullseye’s promotion technology is seamlessly embedded into store or dealer locator search results with an “offer” bar directly below each location where coupons are offered. Users can view or print promotion details by clicking on the link in the “offer” bar. Manufacturers and brands can customize the look and feel of the “offer bar” to match their brand or website and they can configure promotions to run automatically based on category, product, geography and more. 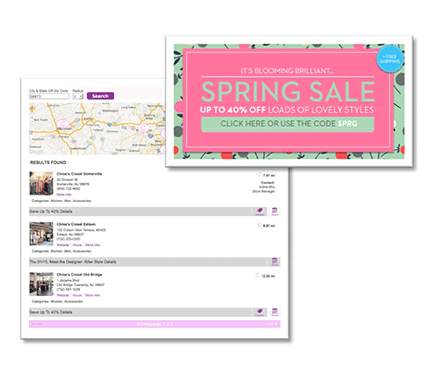 Design and update coupons, promotions, and sale events quickly using our easy-to-use setup tool and editor. Integrates with digital coupon printing and distribution from QPLES. Ask for a demo. Link to external digital coupon page such as QPLEs or link to coupon image hosted with us. Assign promotions to locations in batch or individually. Target locations by category, product, and geography. Get promotions to users at a critical point in the purchase process – searching for a store where they can purchase. Configure promotion thumbnail and promotion copy to dynamically display in map pop-up. Demonstrates tangible value to store locations. Customize the look and display of offers and promotions to match your website or brand.